Traditional sources of revenue for magazine brands are under intense pressure, but the situation is unlocking creative thinking and business bravery, the chief executives of four of the UK's biggest magazine publishers have said. 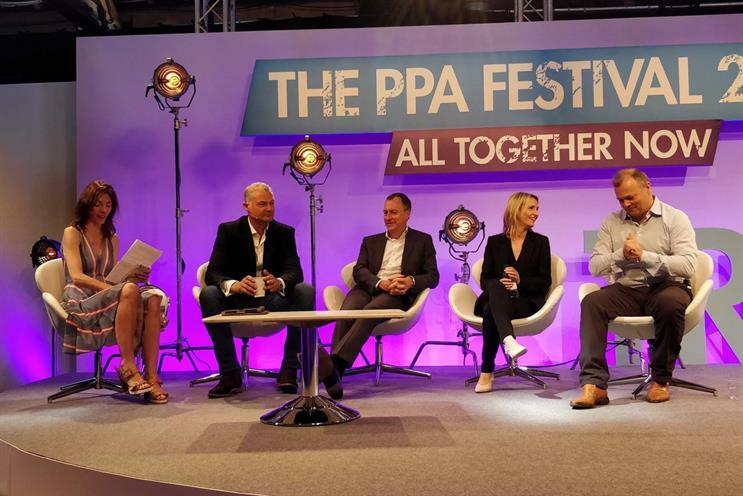 The conversations Hearst Media is now having with advertisers are "much more involved" and less commoditised than in the past, the magazine publisher’s chief executive James Wildman told the PPA Festival in London today. Speaking on a panel chaired by Campaign’s global editor-in-chief Claire Beale, Wildman said he had found the magazine business incredibly exciting since joining Hearst last year from Trinity Mirror. "We’re leading ever more with non-display solutions," Wildman said, explaining how the business is responding to an environment in which traditional adspend on magazine brands has continued to fall sharply. He cited Country Living Hotels, a partnership between the magazine and Coast & Country Hotels, as an example of the innovative products being offered to brands. These changes meant media agencies had to adjust their role, Wildman said. "We wouldn’t disintermediate agencies, because you don’t bite the hand that feeds," he said, but they "now have to differentiate their services – they also have to start moving up the funnel." Wildman was joined on the panel by Bauer Media’s Rob Munro-Hall, Shortlist Media’s Ella Dolphin and Immediate Media’s Tom Bureau. While Shortlist Media was originally entirely ad-funded, Dolphin told the audience that Family, the company’s creative content studio, now made up 50% of its revenues, and she expected this to rise to 60% within 18 months. Looking to the long term she said the challenge for the business was not finding new ideas for growth, but ideas that would provide stability. "What’s challenging is looking at the good stuff now and working out what’s scalable and what’s a distraction," she said. Munro-Hall said that Bauer, like other publishers, was "making bigger bets", such as increasing its activity in events – but that print remained the biggest part of the business. "We are still in the time of launching new content brands," he said. "Over the last five years we’ve launched eight magazines and all are still going." Its latest launch, Simply You, is in the "real life" segment of the market, in which Bauer already offers Take a Break and That’s Life. "There hasn’t been anything new there for a very long time," Munro-Hall said. During development the title, which is aimed at women over 40, "dramatically changed from what we thought we were going to launch," he said. "What fascinated me was watching a group of your target buyers absolutely enthusing about print magazines." However, 85% of Immediate Media’s revenue is not from advertising, Bureau said – a ratio he said was a "really big advantage" for its advertising business because it meant their focus is on "getting very deeply engaged" in interest areas of their brands. Being successful in developing new ventures sometimes meant being ruthless, he added: "There have been three or four projects we’ve killed and upset a lot of people, but you have to do it." The question publishers needed to ask was "how are we moving our culture in a way that allows us to compete with the big platforms or the big forces out there?" he added.